A new viral star just snatched Sweet Brown and Antoine Dodson's wigs. On Monday afternoon, 23-year-old Courtney Barnes was on his way to a local Burger King to "buy a piece of burger from Burger King" in Jackson, Mississippi when he witnessed "a horrible, tragic situation." An SUV plowed into a police cruiser, injuring the officer inside. 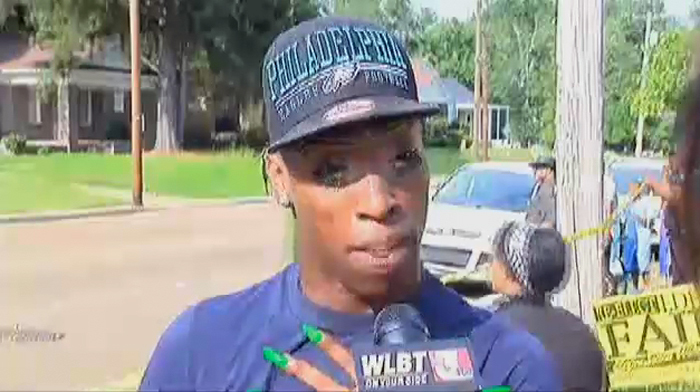 BUT, that story is overshadowed by Courtney, whose epic eyewitness account (video, above) is the best thing on the Internet this year (so far). Courtney, who appeared on the season premiere of So You Could Think You Can Dance last week (video, below), told the judges he's a local celebrity. We reckon he'll be a global Internet star by tomorrow morning and if Wendy knows what's good for her, she'll have Courtney on her show tomorrow. How You Doin'!!! !